I finally got around to reading this! And I love it! I cant wait to read moar!! Another chapter, and a fairly long one compared to the others. I love the attic and basement. Anvi doesn't seem to understand the perils of being a bad nanny. Oh no, another pregnancy! Poor Srik, maybe he should stop making food and try to find a way to escape. I love the bat with Vanity's name on the front page (oh and it's also on the chapter I am reading). So cool. Srik is supersim or something. I know I shouldn't, but I feel so bad for the kids. Although, Larceny is a bit dim, isn't he? Omg twins. Haha, bye bye Anvi! Finally, another one has been posted. This one feels like it took forever. "IT WAS THE HAIR!" Best part!! I'm glad that you were able to kill him off finally! TWO updates have been posted! I probably would have deleted the game or just ran away and let the game run until the social worker came. I was feeling so bad for you having to play that than I did the brats living it. Raven continues to be the best. Hahaha, fire, too bad Yuki caused such a huge point loss for it. Burn, baby, burn! Avarice killing Larceny's project was funny as hell. I'm jealous of your Father Winter woohoo. I want a baby with him because he gives a trait for it. Omg, poor twins. I feel bad for you that they were so miserable. i don't know how you survived. I really considered having Vanity go for the baby with Father Winter but I really really didn't want to start the timer over on another baby since the twins were just about to grow out of toddlerly goodness. Maybe Avarice or one of the later generations. Vanity may have burnt down the world if she had gotten pregnant again. So, I think waiting is a very good idea. There is so much truth in this. Just a quick note that I am not playing my active saves until the aging bug is fixed by EA. Once it is fixed, I plan on focusing on Yuma for a bit instead of bouncing around so I can stay "in the challenge" and maybe get that challenge completed by Christmas. 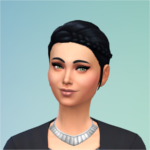 Once the 100 baby challenge is completed, then I will be back and focused on Vanity. A new chapter has been posted! finally all caught up with Vanity!